If the Rio 2016 Paralympic Games shows the world anything, it is that being disable might not mean you can not enjoy life and be active. The games being held from the 7th to the 18th of September brings together disabled athletes from 160 countries to compete in 23 sports. Let’s not forget the 72 medal events in the last winter games or the many international competitions around the world. These elite athletes perform at a level I could not even dream of. Like in the “able” world, not every athlete nor every activity leads to an international event. Many disable individuals have activities in their life that they enjoy just because. For many individuals that includes scuba diving. When thinking about dive accreditation organizations, the HSA may not be on your list. The Handicapped Scuba Association is active in 45 countries and has exist since 1981. It roots is in a 1975 University of California-Irvine (UCI) research program. The program examined self-image changes for scuba diving students ‘with disabilities’ learning together with students ‘without disabilities’. The program showed that individuals with disabilities could learn to become divers with adaption of some of the physical requirements. You need to remember that in the mid-70s, Scuba diving was not a main stream hobby and still generally considered a high risk activity. Jim Gatacre who had a paralyzed right arm was one of the participants in the study and founded the Handicapped Scuba Association (HSA) 5 years after graduating from UCI. The organizations official founding date is June 22nd 1981, the date when Gatacre received the first equipment donation from PADI. In 1984 the Handicapped Scuba Association conducted their first accessible international dive trip to the island of Bonaire off the coast of Venezuela. Working with both the Professional Association of Diving Instructors (PADI) and the National Association of Underwater Instructors (NAUI), the Handicapped Scuba Association developed their own diver certification program. They became an independent diver training and certifying agency in 1986. There are currently over 3,000 HSA instructors around the world. The Handicapped Scuba Association’s certifications are in many ways similar to the certifications of other dive certification agencies. You will find try scuba programs, Open Water Diver, Advance Open water, and the professional levels divemaster, assistant instructor and instructor. The recreational programs are very similar to programs of other training agencies including theory training, confined water training and open water training. They do have an extra element of marine life identification. The professional courses are cross over courses, dive professionals certified by another agency can take the IDC and be certified at the same level in HSA. If a diver upgrade his primary certification say from divemaster to instructor the HSA certification will also be upgraded. The HSA certification system is flexible allowing training and certification of people with a wide range of disabilities, including visually impaired, PTSD, paraplegia, quadriplegia, and those with high-functioning intellectual disabilities. The heart of the training is the HSA Physical Performance Requirements and a multilevel Certification system. The Physical Performance Requirements are the standards that a student must obtain in order to become a certified diver. While they are adapted for different disabilities, they are the same standards that able body students have to meet in courses by agencies such as PADI. Level A: The student has successfully challenged all of the HSA Physical Performance Requirements, demonstrating that he or she can safely SCUBA dive, solve basic personal emergencies, help another diver in distress, and perform basic rescues. They have shown, by successfully challenging these Performance Requirements, that they can perform the skills required to be an effective Buddy and are certified to dive with one other certified SCUBA diver. Level B: The student has successfully challenged those HSA Physical Performance Requirements that demonstrate their ability to safely SCUBA dive, and to solve basic emergencies. However, they are unable to successfully challenge those Performance Requirements that demonstrate their ability to help another diver in distress.Therefore, the LEVEL B diver is certified to SCUBA dive with two dive buddies who are certified Open Water Level A or above. In the case of an emergency, this system will provide an effective dive buddy for all members of the dive team. They also have a dive buddy training program. The dive buddy certification course is meant to prepare certified scuba divers to be able to assist HSA certified divers. The program is similar to the instructor program except it does not include the training methods. Divers learn how to assist HSA divers with a range of different disabilities. See the levels below for the role of a certified dive buddy. The course included 8 hours of instruction, 5 hours of confined water exercises and 4 hours of open water exercises. There are many non-profit organizations that also provide programs for those with disabilities either with HSA or independent. Diveheart also has a training program for adaptive divers, dive buddies and professionals. They are primarily in the US and UK. They have extensive programs and also have international dive trips. Disable Divers International based in Malta has a number of locations around the world with many in Europe offering similar programs. HSA started as an off shoot of a research program concerning self worth. There have been other studies concerning scuba diving and disabilities as well as scuba diving as a treatment or therapeutic activity. While Post Traumatic Stress Disorder (PTSD) is nothing new, it is now more widely recognized as something that can be treated. For many experiencing PTSD, including many wounded warriors, scuba diving has shown to be a remarkable treatment. Some of the programs dealing with PTSD and military service disabilities include The Wounded Warrior Project® (WWP) and The Disabled Veterans SCUBA project. 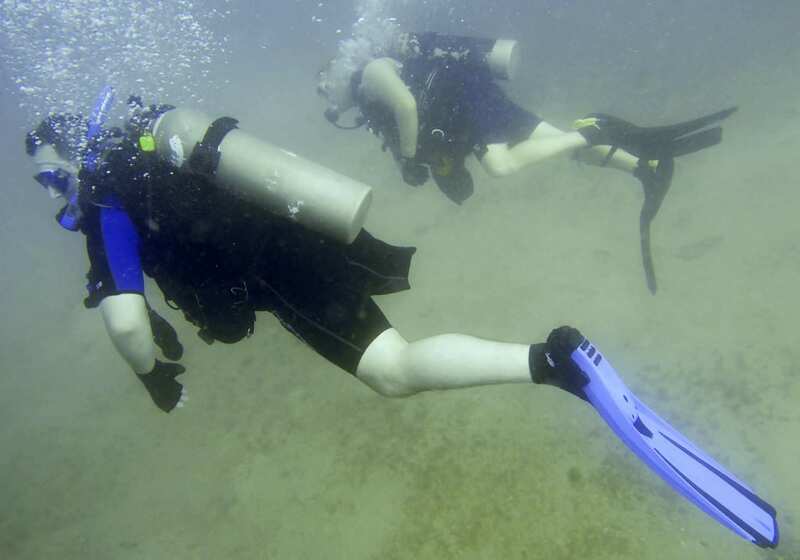 Soldiers Undertaking Disabled Scuba (SUDS) and Deptherapy (UK) are two others with excellent track records of using diving in rehabilitation and therapy. Abstract artwork was brought to life by 462 performers dressed in bright colours who formed geometric shapes to display different images, including illustrations of various winter sports.